George William Abbey was born April 26, 1869, in Byron Twp., Fond du Lac Co., WI, and died April 3, 1943, in Minneapolis, Hennepin Co., MN, at age 73. Buried in Saint Mary's Cemetery, Minneapolis, Hennepin Co., MN. He is the son of Wellington Abbey of Clarke Twp., Newcastle Dist., Durham Co., Canada West, and Laura Estella Watrous of Genesee Junction, Monroe Co., NY. Regina Beatrice "Jean" Levy was born September 4, 1875, in Oshkosh, Winnebago Co., WI, and died July 30, 1969, in Minneapolis, Hennepin Co., MN, at age 93. Buried in Saint Mary's Cemetery, Minneapolis, Hennepin Co., MN. She is the daughter of Thomas Levy of Canada and Mary McCormick of St. John's, New Brunswick, Canada. George William Abbey and Regina Beatrice "Jean" Levy were married Wednesday, April 25, 1900, in the parsonage of St. Peter's Church, Oshkosh, Winnebago Co., WI. Beatrice M. Abbey: Born March 23, 1902, in Fond du Lac, Fond du Lac Co., WI; Died December 22, 1991, in Minneapolis, Hennepin Co., MN (age 89). Buried in Saint Mary's Cemetery, Minneapolis, Hennepin Co., MN. Married September 5, 1934, in Minneapolis, Hennepin Co., MN, to John Robert Hartman: Born September 3, 1902, in Valley Stream, NY; Died November 16, 1980, in Minneapolis, Hennepin Co., MN (age 78). Buried in Saint Mary's Cemetery, Minneapolis, Hennepin Co., MN. Thomas Wellington Abbey: Born August 9, 1904, in Fond du Lac, Fond du Lac Co., WI; Died July 29, 1998, in Saint Louis Park, Hennepin Co., MN (age 93). Married May 16, 1929, in Minneapolis, Hennepin Co., MN, to Eleanor Carney Murphy: Born April 5, 1908, in the Town of Whitman, Plymouth Co., MA; Died May 30, 1969, in Orange Co., CA (age 61). Donald George Abbey: Born September 29, 1906, in Fond du Lac, Fond du Lac Co., WI; Died October 4, 2000, in Chandler, Maricopa Co, AZ (age 94). Buried in Saint Mary's Cemetery, Minneapolis, Hennepin Co., MN. Married to Lois Adeline Tierney: Born March 31, 1918, in Atwater, Kandiyohi Co., MN; Died December 20, 1984, in Minneapolis, Hennepin Co., MN (age 66). Buried in Saint Mary's Cemetery, Minneapolis, Hennepin Co., MN. George William Abbey Jr.: Born January 15, 1910, in Fond du Lac, Fond du Lac Co., WI; Died May 16, 1991, in Glendale, Los Angeles Co., CA (age 81). Buried in Forest Lawn Mortuary, Glendale, Los Angeles Co., CA. Married August 10, 1946, in Grant Co., SD, to Leora Lavon Jones: Born February 4, 1923, in Unknown. Harold Burt Abbey: Born September 5, 1911, in Fond du Lac, Fond du Lac Co., WI; Died June 7, 1991, in Mercy Hospital, Cedar Rapids, Linn Co., IA (age 79). Buried in Baker Cemetery, Linn Co., IA. Married May 30, 1952, in Minneapolis, Hennepin Co., MN, to Alice Louise Phillipson: Born January 23, 1902, in Linn Co., IA; Died August 24, 1997, in the Meth-Wick Community, Cedar Rapids, Linn Co., IA (age 95). Buried in Baker Cemetery, Linn Co., IA. She lived in San Diego, CA, in 1981. James Gordon Abbey: Born September 7, 1917, in Fond du Lac, Fond du Lac Co., WI; Died August 6, 2000, at Serenity House in Tomah, Monroe Co., WI (age 82). Married January 23, 1965, in Hennepin Co., MN, to Patricia Elsie "Pat" (Unknown) Botcher: Born about 1927 in Unknown. Patricia was first married to Adolph Claude "Alec" Bocher: Born June 20, 1918, in Mound Prairie Twp., Houston Co., MN; Died August 19, 1992, in Bangor, La Crosse Co., WI (age 74). Buried in Neshonoc Cemetery, West Salem, La Crosse Co., WI. Adolph and Patricia were already married and living in La Crosse, WI, in 1955. Adolph was first married January 20, 1945, to Calverna Jeanette Tausher: Born May 4, 1921, in Wisconsin; Died September 13, 1964, in La Crosse Co., WI. Filed for divorce in 1946. 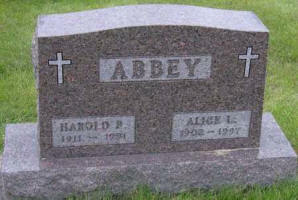 Harold Bert Abbey and his wife, Alice Louise (Phillipson) Abbey, are buried in Baker Cemetery, Linn Co., IA. George William Abbey was born April 26, 1869, in Byron Twp., Fond du Lac Co., WI. The 1870 U. S. Census taken on June 6, 1870, shows Wellington Aby (age 29) born in Canada West, and with real estate of $4,000 and personal estate of $700 is a Farmer and is living in Byron Twp., Fond du Lac Co., WI Living with him is his wife, Laura Estelle Aby (age 24) born in New York, as well as their son George Aby (age 1) born in Wisconsin. Also living there is Wellington's brother, Orrin Aby (age 23) a farm laborer born in Canada West. The 1870 U. S. Census taken on June 3, 1870, shows Thomas Levy (age 37) born in Canada with real estate of $2,000 and personal estate of $300 is a Merchant Taylor and is living in the 2nd Ward, City of Oshkosh, Winnebago Co., WI. Living with him is Mary Levy (age 37) born in New Brunswick, who is Keeping House. Also living there are six children, all born in Wisconsin: Margrette Levy (age 13); Thomas Levy (age 11); Frank Levy (age 9); Mary Levy (age 7); Charlie Levy (age 5); and William Levy (age 3). Regina Beatrice "Jean" Levy was born September 4, 1875, in Oshkosh, Winnebago Co., WI. The 1880 U. S. Census taken on June 7, 1880, shows Wellington Abbey (age 40) born in Canada is a Farmer living in Byron Twp., Fond du Lac Co., WI. Living with him are his wife of Laura Abbey (age 34) born in New York, and their children George (age 11), Bert (age 7), and Edith (age 5). The children were born in Wisconsin. Two servants were also living in the household. The 1880 U. S. Census taken on June 4, 1880, shows Thomas Levi (age 47) born in New Brunswick to Irish-born parents is living in Oshkosh, Winnebago Co., WI. Living with him is his wife, Mary M. Levi (age 43) born in New Brunswick to Irish-born parents, who is Keeping House. Also living there are his seven unmarried children, all born in Wisconsin to New Brunswick-born parents: Frank Levi (age 18), a Printer; Mamie Levi (age 17), a Taiorless; Charles Levi (age 15), an Errand Boy in a Store; Willie Levi (age 13); Tessie Levi (age 9); Regene Levi (age 6); and Bert Levi (age 4). Thomas Levy died March 29, 1897, in Oshkosh, Winnebago Co., WI. George W. Abbey of Fond du Lac to Wed Regina B. Levy of This City. The approaching wedding of George W. Abbey of Fond du Lac and Regina B. Levy of this city is announced to occur late Wednesday afternoon at the parsonage of St. Peter's Catholic church in this city. To the friends of the coming bride, who is a young lady of charming personality, the announcement will come as an agreeable surprise, as the secret has been well kept. The bride-to-be is a daughter of Mrs. Mary Levy of 354 Waugoo street. For the past six years she has been an operator in the employ of the Wisconsin Telephone company, and later with the Northwestern company, and her really capable and efficient work will be greatly missed by telephone patrons. The prospective groom, Mr. Abbey, is a young business man of Fond du Lac and is engaged in the grocery business. Following the wedding the young couple will take a train and go to Fond du Lac, where they will embark in housekeeping. A very simple wedding in which George W. Abbey of Fond du Lac, and Miss Regina B. Levy of this city were the principals was solemnized at the parsonage of St. Peter's church Wednesday afternoon at five o'clock. Rev. Father Hogan of St. Peter's performed the ceremony in the presence of immediate relatives of the contracting parties. The bride was attired in a traveling gown of blue. Immediately after the ceremony Mr. and Mrs. Abbey departed on the Wisconsin Central at 5:30 for Fond du Lac where they will reside. The 1900 U. S. Census taken on June 14, 1900, shows George W. Abbey (age 28) born April 1878 is a Grocer renting at 13 Division Street, Fond du Lac, Fond du Lac Co., WI. Living with him is his wife, Regina B. Abbey (age 25) born June 1874 in Wisconsin to Maine-born parents. They had been married less than one year and had no children. The 1905 Wisconsin State Census taken on June 1, 1905, shows George Abbey (age 35) born in Wisconsin to Canadian and United States-born parents is a Traveling Man renting his home in the 16th Ward, City of Fond du Lac, Fond du Lac Co., WI. Living with him is his wife, Regina Abbey (age 30) born in Wisconsin to New Brunswick-born parents. Also living there are his two children, both born in Wisconsin to United States-born parents: Beatrice Abbey (age 3); and Thomas Abbey (age 1-1/12). Also living there is George's widowed mother; Stella Abbey (age 60). A Boarder also lives in the household. The 1910 U. S. Census taken on April 25, 1910, shows George W. Abbey (age 40) born in Wisconsin to English Canadian and New York-born parents is a Commercial Candy Salesman renting his home and is living at 1 Boyle Place, 16th Ward, City of Fond du Lac, Fond du Lac Co., WI. Living with him is his wife of 10 years, Regina Abbey (age 34) born in Wisconsin to English Canadian-born parents, with all 4 of the children born to her still alive. Also living there are his four children, all born in Wisconsin to Wisconsin-born parents: Beatrice Abbey (age 8); Thomas Abbey (age 5); Donald Abbey (age 3); and George Abbey (age 3/12). Also living there is his widowed mother, Estella Abbey (age 64) born in New York to Massachusetts-born parents, with 3 of the 5 children born to her still alive. A Boarder also lives in the household. Levy - Mrs. Mary Levy, aged 80 years, and mother of Mrs. G. W. Abbey, of this city, died early this morning at her home in Oshkosh. Surviving she leaves five sons, W. H. Levy, Oshkosh, Dr. Albert Levy, Freeport, Ill., Thomas Levy, Detroit, Charles and Frank Levy, Chicago. There are also four daughters, Mrs. Abbey, this city, Mrs. Thomas Wall, and the Misses Margaret and Mamie Levy, all of Oshkosh. The funeral will be held Wednesday. Mrs. Levy was an aunt of Mrs. D. Mahoney, 190 East Second street, this city. She was born in St. John's, New Brunswick, but was married in Oshkosh, where she has spent a greater part of her life. Mrs. Levy has been in the best of health considering her age. Her death came suddenly. Pioneer Resident of This City Expires with a Sudden Attack of Heart Trouble - Had Been Feeling Well Sunday, but Became Ill Early This Morning - Had Resided Here Sixty-Four Years. At an early hour this morning death claimed Mrs. Thomas Levy of 53 Waugoo street, a pioneer resident who was held in highest esteem. The call came unexpectedly, thereby increasing the shock to the family. Sunday she had appeared to be in her customary health and was up and about the family residence, enjoying the activities that usually claimed her daily attention. About 2:30 o'clock this morning she became ill and the end came at 3:30 o'clock, heart failure being the cause. Mrs. Levy was born in 1832 in New Brunswick, Canada, and would have been eighty-one years of age next November. She came to Oshkosh in 1849, sixty-four years ago. Her husband died sixteen years ago. He was a pioneering clothing merchant, having been a member of the firm of Levy & Duncan. Those surviving are four daughters, Mrs. G. W. Abbey of Fond du Lac and Mrs. J. H. Wall and the Misses Margaret and Mary Levy, all of this city, and five sons, T. A. Levy and Frank Levy, both of Chicago, Dr. C. J. Levy of Freeport, Ill., and William H. Levy of this city. The funeral is to be held Wednesday, with services at 9 a. m. at St. Peter's church on High street. It is the request of the family that floral tributes be eliminated. The 1920 U.S. Census taken on January 11, 1920, shows George Abbey (age 47) born in Wisconsin to English Canadian and New York-born parents is a Commercial Traveler of Candy and owns his own home free of a mortgage and is living at 35 Olcott Street, 12th Ward, City of Fond du Lac, Fond du Lac Co., WI. Living with him is his wife, Regina Abbey (age 42) born in Wisconsin to English Canadian-born parents. Also living there are his unmarried children, all born in Wisconsin to Wisconsin-born parents: Beatrice Abbey (age 19); Thomas Abbey (age 15); Donald Abbey (age 13); George Abbey (age 9); Harold Abbey (age 8); and Gordon Abbey (age 2). Also living there is George's widowed mother, Estella Abbey (age 75) born in New York to Massachusetts and Connecticut-born parents. The 1930 U. S. Census taken on April 15, 1930, shows George W. Abbey (age 59) born in Wisconsin to English Canadian and New York-born parents and first married at age 30 with real Estate of $11,500 is a Commercial Trader of Candy owning his own home and is living at 3129 James Avenue South, 8th Ward, City of Minneapolis, Hennepin Co., MN. Living with him is his wife, Regina B. Abbey (age 50) born in Wisconsin to English Canadian-born parents and first married at age 21. Also living there are his children, all born in Wisconsin to Wisconsin-born parents and all unmarried except for Thomas: Beatrice M. Abbey (age 28), a Stenographer; Thomas W. Abbey (age 26) and first married at age 25, a Handyman Woods Trimmer; Donald G. Abbey (age 24), a Service Man for Borough Mech. ; George W. Abbey (age 19), a Clerk in a Department Store; Harold B. Abbey (age 17); and James G. Abbey (age 11). The 1940 U. S. Census taken on April 9, 1940, shows G. W. Abbey (age 67) born in Wisconsin, and 5 years ago was living in the Same House, and with 2 years of College, is Retired and owns his home worth $3,000 and is living at 3645 Colfax Avenue South, 8th Ward, City of Minneapolis, Hennepin Co., MN. Living with him are: his wife, Regina Abbey (age 64) born in Wisconsin and 5 years ago was living in the Same House, and with 2 years of College; his unmarried son, Gordon Abbey (age 20) born in Wisconsin, and 5 years ago was living in the Same House, and with 4 years of High School, a Welder; his married son, George Abbey Jr. (age 30) born in Wisconsin, and 5 years ago was living in Phoenix, Maricopa Co., AZ, and with 4 years of High School, a Swimming Teacher at a Minneapolis Club; his married son-in-law, John Hartman (age 38) born in New York, and 5 years ago was living in the Same House, and with 4 years of High School, a Swimming Coach at a Minneapolis Club; his married daughter, Beatrice Hartman (age 38) born in Wisconsin, and 5 years ago was living in the Same House, and with 4 years of High School. George William Abbey died April 3, 1943, in Minneapolis, Hennepin Co., MN, at age 73. 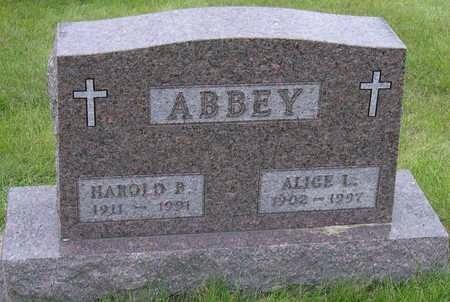 Regina Beatrice (Levy) Abbey died July 30, 1969, in Minneapolis, Hennepin Co., MN, at age 93. Harold B. Abbey, 79, of 3760 12th Ave. SW, died Friday in Mercy Hospital after a short illness. Services: 9 a.m. Monday, St. Jude's Catholic Church. Burial: Baker Cemetery. Friends may call from 4 to 8 p.m. today in Turner Chapel West, where a vigil service will be at 7. Surviving are his wife, Alice; a sister, Beatrice Hartman of Minneapolis; and three brothers, Thomas and Donald, both of Minneapolis, and James of Sparta, Wis. He was preceded by a brother, George, of Glendale, Calif. Harold was born Sept. 5, 1911, in Fond du Lac, Wis., and married Alice L. Phillipson on May 30, 1952, in Minneapolis. He was in civil service with the U. S. Department of Agriculture until retiring in 1971. Harold served in the Navy during World War II and was a member of St. Jude's Catholic Church, the National Association of Retired Federal Employees and Hanford Post 5 of the American Legion. The Rev. Donald Bruggeman will officiate. Memorials to Baker Cemetery or the Cancer Society. Alice Phillipson Abbey, 95, a resident of The Meth-Wick Community, died there Sunday, Aug. 24, 1997, following a long illness. Services: 11 a.m. Wednesday, Turner Chapel West, where friends may call from 10 a.m. until service time. Burial: Baker's Cemetery. The Rev. Kenneth Bell and the Rev. Rollin Oswald will officiate. Survivors include a niece, Gail Hronik of Cedar Rapids. She was preceded in death by her husband, Harold Abbey; two sisters, Addie Phillipson and Lila McRoberts; and two brothers, Glenn and Thomas Phillipson. Alice was born Jan.. 23, 1902, in Linn County, the daughter of Frank and Minnie Phillipson. She married Harold Abbey on May 30, 1952, in Minneapolis. He died in June 1991. She worked for the Probate Court in Maples Hennepin County, Minn., until her retirement. She was a member of St. Mark's Methodist Church. No flowers; memorials may be made to Baker's Cemetery. Deceased Name: Abbey, George W.
Abbey, George W., 81, of Glendale, retired physical therapist. Services will be at 3 p.m. Monday at First United Methodist Church, Glendale. Burial private. Forest Lawn Mortuary, Glendale. BANGOR, WIS.-- ALEC C. BOTCHER, 74, OF W1972 JONES ROAD, BANGOR, DIED Wednesday, Aug. 19, 1992, at his home. He was born on June 20, 1918, in rural Houston, Minn., to William F. and Meta Jane (Vix) Botcher. He married Charlotte B. Meyer on Dec. 31, 1979, in Bangor. He was an Army veteran of World War II and a member of Gittens-Leidel American Legion Post 595 of La Crescent, Minn. He was a graduate of Minnesota School of Business, with a degree in business. He was a certified public accountant and was general manager of Paramount Photo in West Salem for 28 years. He later founded Western Real Estate of Sparta, which he was presently operating. He was a member of the National Board of Realtors and the La Crosse Board of Realtors. In addition to his wife, Charlotte, he is survived by a daughter, Virginia K. (Dennis) Zweifel of La Crosse; a son, Bradley P. Botcher at home; a stepdaughter, Tammy (Charles) Jeffers of West Salem; two stepsons, Curtis Bockorny of West Salem and David Bockorny of Bangor; two grandchildren; nine stepgrandchildren; two sisters, Phyllis Burcum of La Crosse and Lois (Louis) Halter of Baxter, Iowa; two brothers, Kenneth Botcher of La Crosse and Raymond Botcher of Houston, Minn.; and many nieces and nephews. He was preceded in death by four sisters and two brothers. Funeral services will be held Saturday at 3 p.m. in St. Paul's Evangelical Lutheran Church, Bangor, with the Rev. Roy Hefti officiating. Burial, with military honors by American Legion Post 595, will be in Neshonoc Cemetery, West Salem. Friends may call at Jostad-Jandt Funeral Home, West Salem, Friday from 6 to 8 p.m., and at the church Saturday from 2:30 p.m. until the time of service. after an illness of several months. was married in 1855 to Nathaniel Phelps, who death occurred ten years ago. the remained constant until the end. Six children remain to survive their loss. Four daughters, Mrs. C. B.
SPARTA, Wis. -- James G. Abbey, 82, of Sparta, died Sunday, Aug. 6, 2000, at Serenity House in Tomah. Funeral services will be at 11 a.m. Wednesday at St. Patrick's Catholic Church, Sparta. Friends may call one hour prior to services Wednesday at the church. Lanham-Kann Funeral Home, Sparta, is assisting the family with arrangements.